We ride an old and shaky elevator to the top floor of the Warren Town Hall and step back in time. Suddenly, we are part of the warp and weft of rural life. How many have gathered here before us for entertainment, for politics, to simply come together as a community? Tonight we are part of a small benefit concert to help feed the hungry over the holiday. 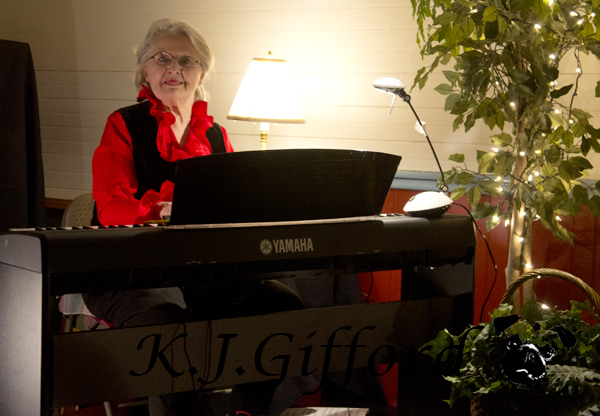 My friend Joan, Waffles’ breeder and a former concert pianist, sits at the keyboard playing background music before the show starts. She is one of those people about whom it may be said, “she cleans up well,” because most of her days are spent in her work duds, allowing her to haul wood, mop floors and care for her pugs at the sprawling yellow house she used to share with her husband Charlie before his death. Tonight she is in concert gear – red silk blouse with ruffled collar, black pants and vest with gold trim buttons. In the incandescent light, her hair looks more blonde than gray. Someone has decorated the stage with white Christmas lights, greenery and electronic candles. Three elegant Celtic harps sit to the side of the stage and a tree-like music stand takes center stage. Dinner tables surround the stage, creating an intimate half-circle for viewers. And, a table of decadent deserts, coffee and cider tempt passersby at the back of the room. I feel a rush of pride for Joan, she is at her best like this and I never tire of hearing the music flow from her fingers. She is infused with it, giving her hands on the keyboard an added lilt, her body an extra cadence. On an average day, music bubbles beneath her skin, leaking out in the way she holds an aging dog, her superhuman energy, her sometimes childlike view of the world. A hidden melody tickles the ivories of everyday life and I can’t help but want to sing along. We listen as harpists and singers, guitarists and violinists make their way across the stage. We hear an anti-war song, the Christmas Bell Medley, Cole Porter, and some original tunes. I feel like crying as I always do when music comes a courting. It is intimate here, close. For centuries, people in small, rural towns have made their way to Town Halls and Churches to gather together and we are doing it once again.